The ITF Play and Stay programme is revolutionising the way that beginners – adults and children alike – are experiencing tennis for the first time by making it fun and playable from day one. Serve rally & score should be all players` first experience of the game. With modified balls, rackets and courts, players of all ages and abilities can truly experience playing the game from their first time on court. 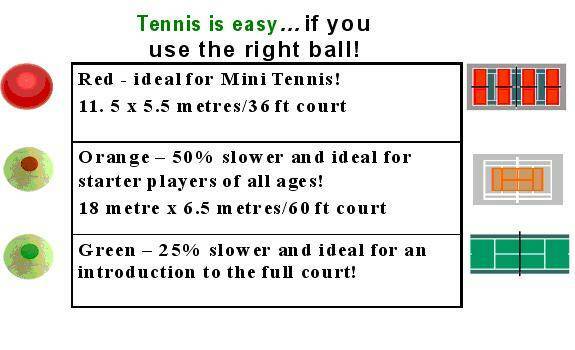 Clubs and coaches play a key role in achieving this objective by actively promoting slower balls and smaller courts for beginner adults & children (see below). With Play & Stay in mind, it is recognised worldwide that the “Games Based Approach” is the most effective method of teaching tennis. A further recent development that tailors tennis to players’ diverse needs is ITF supported changes to competition formats and scoring systems, which better fit with players’ abilities and lifestyles. There are now a host of innovative scoring systems including change, elimination, group, rotation and team formats. They can be viewed in detail at www.tennisplayandstay.com.